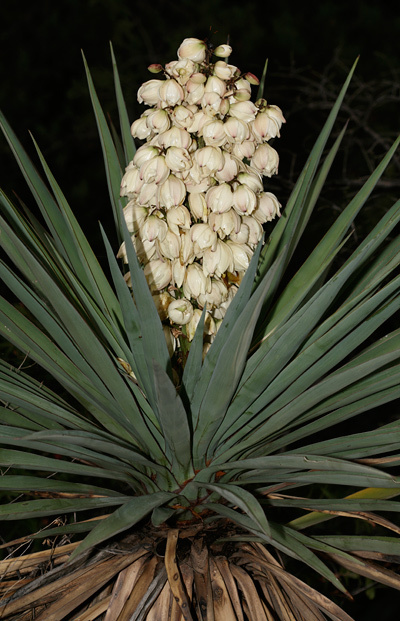 Synonym: Yucca schottii auct. non Engelm. Habitat: Upland, Mountain. 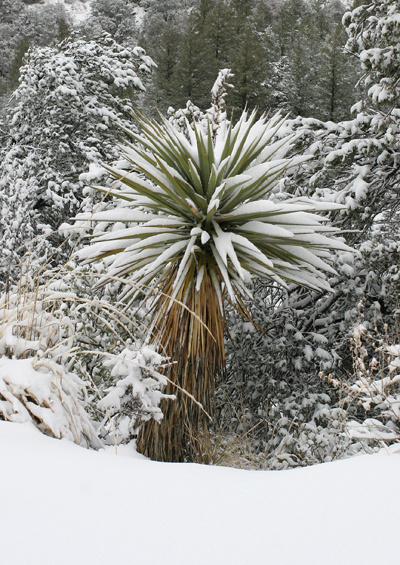 This common mountain yucca grows on slopes and in canyons in Madrean pine-oak woodlands. Flowering Season: Summer. The flowers bloom with the summer monsoon rains. Description: The flowers are in large, showy, erect, paniculate inflorescences that only partly emerge from the leaf rosettes. The pendent, egg-shaped individual flowers have 6 fleshy tepals (petals and petal-like sepals) that are either separate from each other or only barely joined at the base. 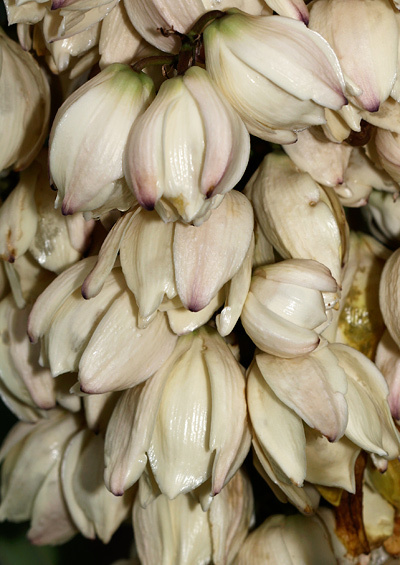 The flowers are pollinated by moths and are followed by large, fleshy, succulent, pendent, green fruits. The leaves form large, dramatic rosettes of erect young leaves and increasingly reflexed older leaves. The leaves are green to glaucous blue-green in color, thin, flexible, elongated, flat to upfolded lengthwise, lance-shaped with smooth, narrow red margins and sharply pointed dark tips, and usually non-filiferous (not producing strings) or rarely sparsely brown- to gray-filiferous. The stout stems are upright, unbranched, short to trunk-like, and covered with a skirt of drooping dead leaves. The plants are solitary (not clump-forming), single-stemmed, and will flower repeatedly over their long lives. The similar Banana Yucca (Yucca baccata) has leaves with narrow brown margins and white strings, while Soaptree Yucca (Yucca elata) has leaves with narrow white margins and white strings. Edible – The flowers, young flower stalks, and the fruits are edible and were eaten by the Native Americans.